Do you know what you should do? You should try Xeoma. With its new feature “Duplicate current scheme” you will easily clone the set up chain as many times as needed. 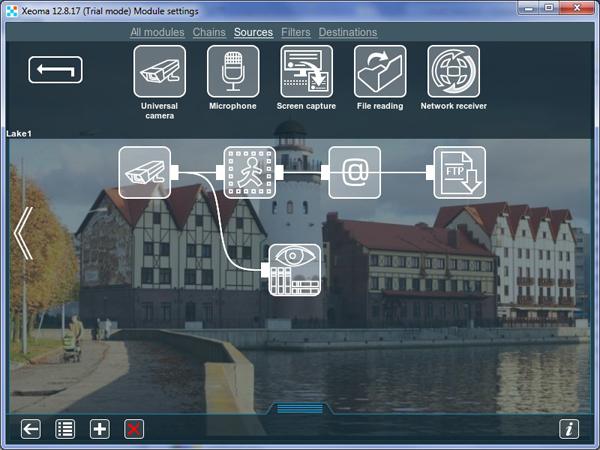 Just configure cameras the way you need afterwards – it is much easier and faster than configuring all the features one after another. You will see how much time it saves you. Step 1. Configure the chain. In our example, it is an IP cam, continuous storing to archive, motion-triggered e-mail notification and upload to FTP server. After all these features are set up (click on a feature’s icon to enter its settings), select ‘Duplicate the current scheme’ in the menu (list icon). Alternative: just click ‘+’ button as many times as you need. The last modified scheme will be duplicated as many times as you clicked the button or selected the menu option. The camera will show the same picture, and archive (or preview, if any) will have the same name. Chains will be identical. Step 2: Go to the camera settings and choose another cam from the list of auto-detected or specify URL manually (for quick access to detailed settings click screw icon in the top right corner of each preview box). Troubleshooting: what if my camera is not auto-detected? 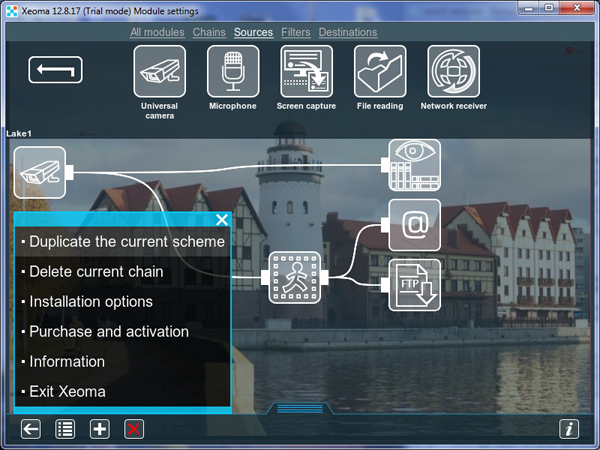 With the new feature of Xeoma Video Surveillance Software you will be able to duplicate your set up chain over a hundred times in a few seconds. 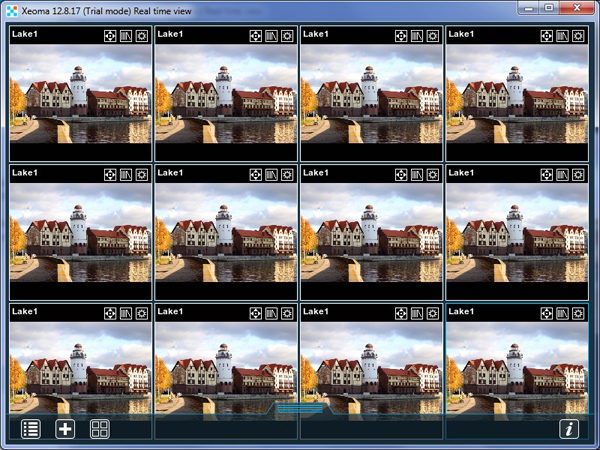 If you have many cameras and main window with preview gives you too small previews, select desired layout mode: 1×1, 2×1, etc. 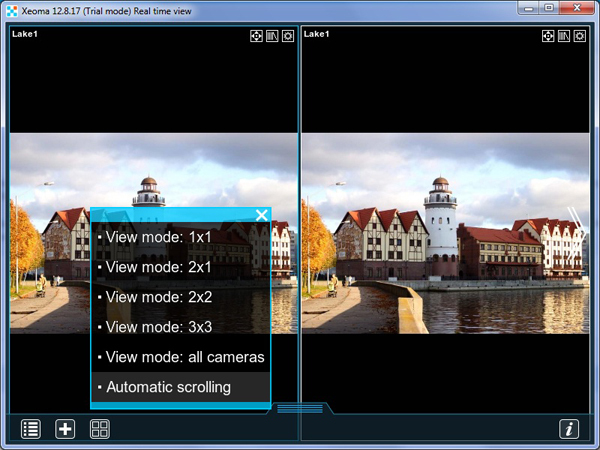 Make cameras rotate at regular intervals with the new option ‘Automatic scrolling’ . Now you can watch all cameras at regular intervals without any clicking. This is not the only feature of Xeoma that helps you save time while being in total control of the situation. Pop up window, scheduler, notifications and advanced false alarm avoiding logic will save your time and the most economical pricing policy for Xeoma licenses will save your money.